I did not know what to expect with the Giving Garden when I arrived at the address given to me in Minneapolis, Minnesota. I knew I was not coming to see a private garden so was not sure what to expect. I arrived at the address and it was a for a company Donaldson, a huge building with a massive parking lot filled with cars. Cristl was there to greet me and she explained Donaldson was a filtration company that had offices all over the world. I was still not sure how the garden came into my visit. As we walked out of the building, past the parking lot Cristl explained to me how the giving garden started. 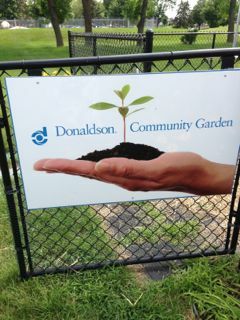 Because of a friendly rivalry with another company, that was doing a giving garden, Donaldson had to start one as well. 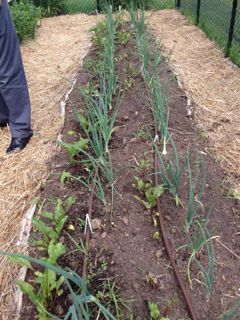 The purpose of the giving garden is to produce as much food as possible to give away to the local community. Cristl explained there were 20 such gardens in the twin cities areas (Minneapolis and St. Paul) where other companies were doing the same thing. 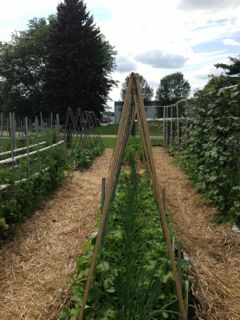 Each garden produces approximate 1000 lbs of fresh veggies for a charity or group of their choosing. 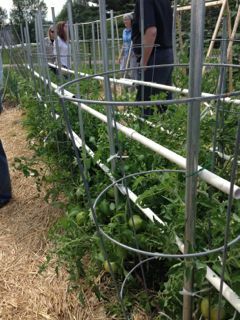 The Donaldson Community garden donates to VEAP (Volunteers Enlisted to Assist People), which is the largest food pantry in Minneapolis. The Giving Garden Twin Cities group meet twice a year, February and September to compare notes and support each other. When planning what to grow Donaldson Community garden core volunteers meet with VEAP to discuss what they would like to receive from them. 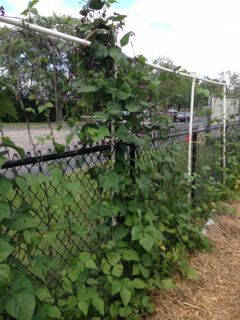 They have been growing for the past 5 years, each year learning something more, as they were all beginners at gardening. 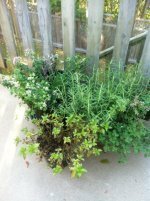 The first year the grass was removed and they brought in garden soil as the existing soil was poor. 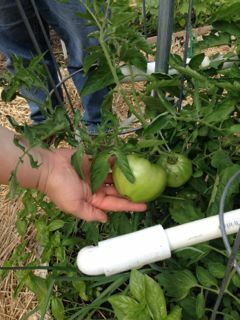 They set up an automated drip irrigation system at the same time. 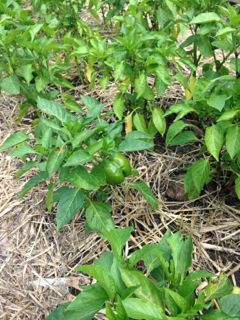 The Donaldson main garden area is 1000 square feet, where this year they are growing tomatoes, beans, peppers, onions, and cucumbers. 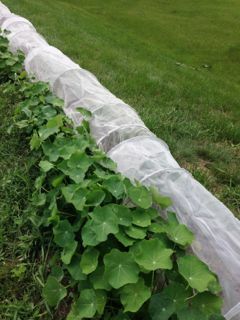 They have another 100 square feet on the hillside just beyond the larger garden area and this year they are growing cabbage and nasturtiums here. Cristl coordinates the volunteers and with a core group they decide on when to plant, set up weeding and harvesting schedules. She has a group of 30 volunteers that put their time in the Donaldson Garden. I was fortunate to meet a few of them. Brad, Diana, Julie, Linda, Cristl and John. The volunteers commit to 1 ½ hours a week in the garden. This is usually done during their lunch hour. The company pays for all garden expenses, which are approximately $1000 per year and all the work is done on volunteer time. They harvest twice a week Monday and Thursday. 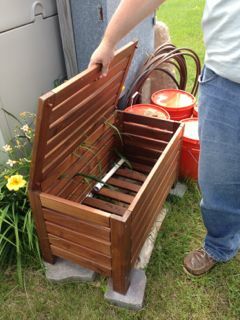 They have a box they put the harvested veggies into, then one volunteer takes them to VEAP. The area is fenced and locked to keep our unwanted people. 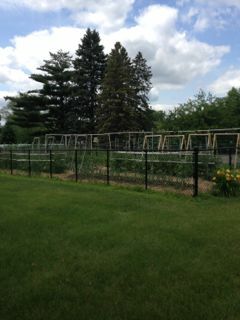 They also have a problem with rabbits so more below ground fencing has been added to keep them out. They have been having problems with some insects and diseases such as Blossom end rot on the tomatoes, powdery mildew on zucchini and this year they are watching the cabbage for cabbage worm. 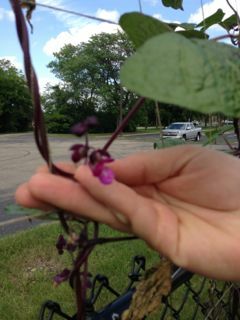 They had problems in the past with the Japanese beetle, however with some research they found the purple bean was not affected so have been growing that variety every since with no problem. 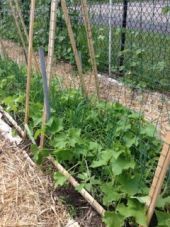 Last year they started coordinating with the Master Gardener Program at the University of Minnesota to get advice with their gardening questions and concerns. 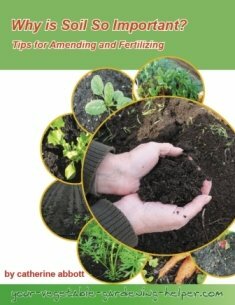 One thing they started to implement is setting up a planting rotation, as they had not been doing this. This will most likely help with their insect and disease problems in the future. Where the harvested veggies go. 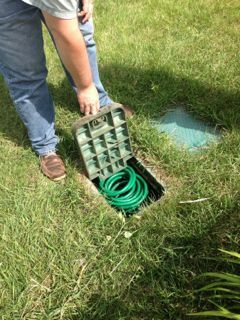 Drip irrigation set up with underground pipe. I felt the garden was very functional, well laid out and would be easy to work in. 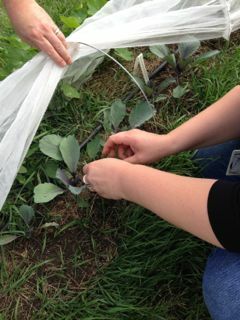 The straw between the beds helps keep the volunteers clean, as they are usually in their office clothes. Last year they produced 700 lbs of vegetables, so want to beat that this year. I was truly inspired by what these companies and their employees are doing for their community. 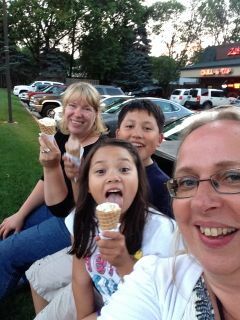 Cristl and her children Ethan and Chloe were generous enough to take to out to dinner, we went to a beautiful sculpture garden and played mini golf (my first time) and ended the evening with ice cream. 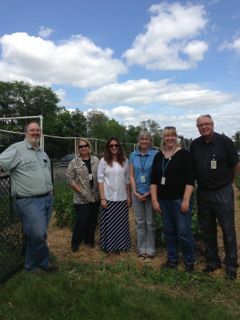 Thank you to Cristl and the Donaldson Volunteers for showing me your Giving Garden. 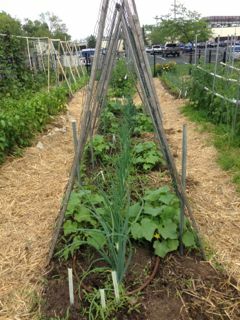 Return from The Giving Garden to Organic Vegetable Garden.